When I pick up a book to read it I have an almost overwhelming desire to know something about the person writing the book before I even flip the pages of that book. I want a connection between that person and myself in order to justify committing myself to their momentary care. I look first at book forwards or introductions or at least the author’s brief inside the front cover. This is true whether the book is a work of fiction or a technical manual. Without this beginning I have a hard time relating myself to the author; I have this need to know something about them. Some almost 50 years ago when I was a beginning college student I always avoided classes taught by "staff" or "to be announced" if there was an option, and when there was a name listed for a course I got out my college catalogue and looked up the faculty member teaching the course and tried to find out as much about them as possible before I committed myself and my hard-earned tuition money to their care. "Matt Kloskowski is the Education and Curriculum Developer for the National Association of Photoshop Professionals. He has authored and co-authored 3 books on Photoshop or Illustrator and teaches an advanced Photoshop course for Sessions.edu. In addition to being an Adobe Certified Expert in Photoshop, Matt is a regular contributor to Photoshop User Magazine and writes weekly columns for several digital imaging websites". He is one of the co-hosts for Photoshop User TV where with Scott Kelby and Dave Cross he teaches Photoshop and Photoshop Lightroom. Their easy-going, informative, and sometimes humorous teaching methods makes learning easy. That ought to tell you enough to take him seriously, especially if you are a reader of PHOTOSHOP USER magazine because then you will already be familiar with his name and teaching methods, and you will be ready to commit yourself to his care for a couple of days while you do some serious learning. While the book is written primarily for Photoshop CS3 a number of the techniques and steps work equally well in Photoshop CS2. First of all, here’s where to locate the images to follow along with the lessons; I put them in just in case you’re the type not to read the introduction where Matt tells you about them, and without them you’re lost. Now let’s look at the chapters and the material each contains. This list will take you through a thorough understanding of layers from the beginning to the powerful professional image correcting steps of the Photoshop user professional. Chapter 1. Layer Basics; Using Multiple Layers; Everything Else About Layers; Summary. Chapter 2. Blending Layers; The Three Blend Modes You Need Most; (Multiply Blend Mode; Screen Blend Mode; Soft Light Blend Mode); A Closer Look At Blend Mode; Layer Blend Modes for Photographers; Advanced Layer Blending; Summary. Chapter 3. Adjustment Layers; Adjustment Layer Basics; Making Selective Adjustments; Super Flexible Adjustments; Some More Adjustment Layer Ideas; Fix One Photo-Fix ‘Em All; The Adjustment Layer Blend Mode Trick; Summary. Chapter 4. 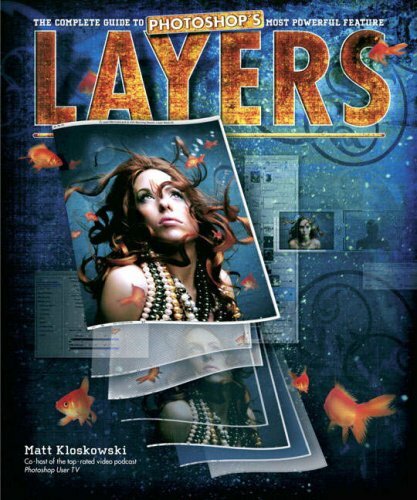 Layer Masks; (read this intro Matt says, even if you don’t read any other- I’ve warned you); Layer Mask Basics; Automatically Creating Layer Masks; The Only Layer Mask "Gotcha"; Combining Multiple Images; A Deeper Look Into Layer Masks; Making One Layer Fit Into Another; Summary. Chapter 5. Type and Shape Layers; All About Shape Layers; Summary. There you have nine chapters in 248 pages of well written and easy to follow tutorials. Matt tells you in the beginning that you can open the book and start anywhere. If you discover you are in over your head you can back up a chapter or two and start again and see if you are up to speed. As a photographer, Chapters 6, 7, and 8 were of particular interest to me and either confirmed my own working procedures or suggested an alternate method that I’ll have to experiment with a bit to see if that method might replace what I have been doing. I’m never too old to learn; that’s why I bought the book. One of the things I particularly liked about the book was that each chapter ended with either a summary or a page answering specific questions related to the procedures that had been covered in that chapter. I like this approach very much because it provides a review when I come back to the book after a period of time and need to review to get up to speed again. Let’s face it, seldom does an individual sit down a go through a book from the front to the back in one sitting; dealing with chapters is more like it where in our busy lives we manage to fit in one or two chapters at a time. We all need review and summary pages. A couple of the chapters covered subjects that I have never previously had the need to work with, but were nonetheless interesting. I tend to put small, colored, plastic tags on pages in any book I intend to keep so that I can return to the pertinent pages at a later time. I’ve tagged up a number of pages in Matt Kloskowski’s book so that it will be easy to return to the specific tutorials if the need arises. Knowing the state of the photography business and the part post-production plays in the field today, I suspect I will have to update my techniques and work-flow to later accommodate some subjects or techniques that I have previously not needed to know. When that time comes, my well stocked, and well-marked bookshelf will be there to provide the refresher I need. I recommend Matt Kloskowski’s Layers: The Complete Guide to Photoshop’s Most Powerful Feature to the beginner and intermediate Photoshop user with a nod to a couple of chapters that might be useful to the very advanced Photoshop user. It explains in plain and simple language and in specific step-by-step illustrations a thorough feeling for the use of layers as an extremely powerful tool in Photoshop CS3.